The National Epilepsy Awareness week was celebrated last September 1-6, 2014 with the theme: “EPILEPSY: TIGIL ATAKE… TULAY SA TAGUMPAY.” Nevertheless, I'd still like to join and help promote it. Below is the press release. Our advocacy for epilepsy continues. We celebrate National Epilepsy Awareness week from September 1-6 this year with the theme: “EPILEPSY: TIGIL ATAKE… TULAY SA TAGUMPAY.” In this regard, may we enjoin you to help us in our media campaign? For this year, the week will start off with a TRIPARTITE SYMPOSIUM FOR NEUROLOGISTS: MARIJUANA IN EPILEPSY to be held at SULO HOTEL on September 1, 2014. This will be a forum among neurologist to discuss the emerging issues on Medical Marijuana and to hopefully come out with a consensus statement on its role in the management of Epilepsy in the Philippines. 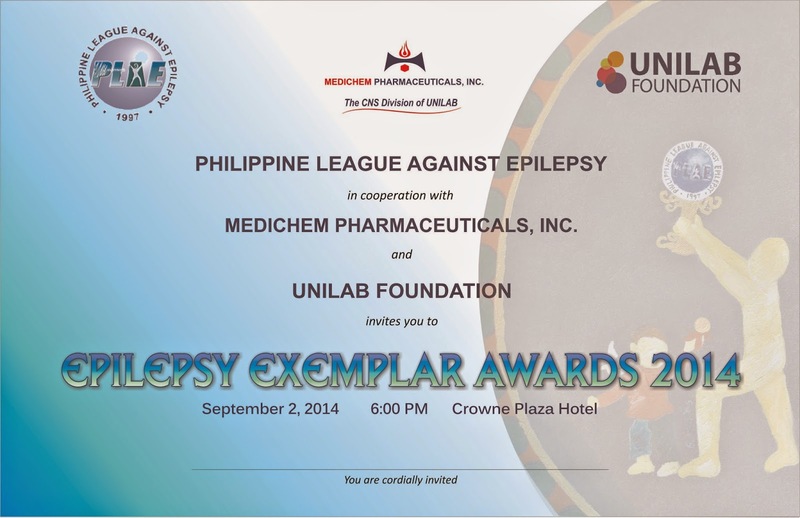 On September 2, the 2014 Epilepsy Exemplar Awards will be held at the Crowne Plaza. This awards night gives recognition to persons with epilepsy who have gone beyond their disease and have excelled in either their profession or in school. To culminate the week’s major activities, a National Epilepsy Week Camp will be held at the Queen Margarette Hotel in Lucena City, Quezon. This is going to be a whole day affair were lay delegates will be given lectures on epilepsy. There will be also small group discussions that can be a venue for them to clarify issues that confront them in dealing with the disease. 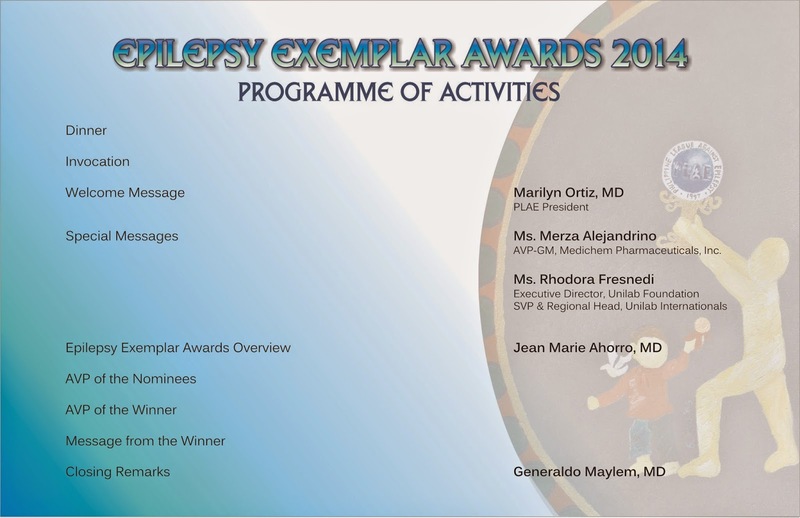 Apart from the above activities, members of PLAE will also hold nationwide simultaneous round table discussions, lay fora and school caravans in their area of practice during the duration of the epilepsy week. Also, enclosed with this letter is a press release kit which you can use in writing articles on epilepsy which can be broadcasted or printed. Should you need further materials or information, you can contact us by cell phone or thru our email. Thank you very much for your continued support throughout the years. Epilepsy is present in around 1% of the global population. This may be higher in developing countries. In a country such as the Philippines with a population of 93 million, this means that an estimated 930,000 people suffer from epilepsy. Local prevalence study: 230 persons with epilepsy / 100,000 population. Epilepsy strikes most often among the very young and the very old, although anyone can get it at any age. People with epilepsy can die of seizures and related-causes, including status epilepticus (non-stop seizures), sudden unexpected death in epilepsy (SUDEP), drowning and other accidents. Twenty to thirty percent of people with epilepsy are severely affected and continue to have seizures despite treatment. Of major chronic medical conditions, epilepsy is among the least understood even though one in three adults know someone with the disorder. Lack of knowledge about proper seizure first aid exposes affected individuals to injury from unnecessary restraint and from objects needlessly forced into the mouth. The leading non-medical problem confronting people with epilepsy is discrimination in education, employment and social acceptance. The association between epilepsy and depression is especially strong. More than one of every three persons with epilepsy are also affected by the mood disorder, and people with a history of depression have a 3 to 7 times higher risk of developing epilepsy. From studies abroad, depression is reported by 24-74% of patients with epilepsy; anxiety in 10-25%. Around 64% of people with epilepsy in the Philippines suffer from anxiety and 51% from depression. Living with epilepsy presents challenges affecting many aspects of life, including relationships with family and friends, school, employment and leisure activities. It is a mental condition and leads to insanity. Fact: Epilepsy is a brain condition characterized by recurrent seizures. Seizures are sudden, brief abnormalities of behavior, thought, movement or sensation generally lasting for a few minutes. Seizures are caused by a hyperactive, disorganized electrical activity from the brain. Although psychosis may be found in only 2-7% of persons with epilepsy, it is the exception rather than the rule. It is caused by spirit possession or “pagsasapi”. Fact: Although movies, literature and folklore refer to seizures as arising from a spirit possession because of some similarities in their manifestations, seizures can be documented scientifically as abnormal brain activity on EEG, unlike demon possession. Seizures are not dealt with by exorcism or prayer; only by medications and in other cases, brain surgery and a special diet (ketogenic diet, doctor prescribed). It is contagious or can be inherited. In the past decades, this fallacy has caused many patients with epilepsy to be shunned from society and from pursuing marriage and having a family. Fact: Many conditions can cause epilepsy. In a small number of patients (10-15%), the susceptibility or predisposition to develop seizures may be inherited. However, for the most number of patients, it can be due to other brain insults. It may happen in those with a history of head injury. It may also happen to those with hypoxic brain injury sustained from a birth complication ( lack of brain oxygen in the baby during child birth – ex. due to coiled cord around neck of baby, difficult labor, maternal complications leading to fetal distress). It may also result from an infection of the brain (meningitis, encephalitis), brain tumors, strokes, prolonged convulsions in childhood. The cause may be unknown in around 40% of cases. Epilepsy patients are retarded. Fact: This is a misperception because epilepsy is highly prevalent among other disability groups such as autism (25.5%), cerebral palsy (13%), Down syndrome (13.6%) and mental retardation (25.5%). However, if one looks at the entire population of people suffering from epilepsy, majority of them have normal IQs, are able to go to school and sustain gainful employment. Patients with epilepsy shouldn’t get stressed so they should not study or work or indulge in sports and leisure activity. Fact: The relationship between the occurrence of psycho-mental stress and seizures is at present unstudied. Patients associate stressful periods with an increase in seizures. Many experts believe it is the effects of stress such as disturbed sleep and missing meals and medications that bring about an increase in seizures rather than the psychological or mental preoccupation itself. The fact that there are philosophers, world leaders, artists, writers, politicians and athletes who have epilepsy prove that epilepsy should not pose a limitation to mental and physical activities. When a patient starts to have a seizure, the best first aid is to stick a spoon inside his mouth. Fact: When a person goes into a seizure, there are very powerful muscle contractions that suddenly cause him to fall, stop breathing, bite his tongue and clamp his jaw. Inserting an object into his mouth has been found to be more detrimental to the patients and has caused dental fractures, mouth lacerations and suffocation. It is not encouraged. Rather, one should 1) cushion the patient’s head with a soft pillow, 2) loosen his clothing around the neck, 3) remove harmful objects around him which can hurt or injure him, 4) turn him to his side to prevent suffocation and allow drainage of saliva and 5) time the seizures. If seizures last 5 minutes or more or the patient has been injured, the patient should be brought immediately to the emergency room. Antiepileptic medications are toxic (“ naluluto ang utak”) and should not be taken for a long time. Fact: Epilepsy is a chronic condition and needs long term intake of antiepileptic drug, the minimum of which is 2-5 years, depending on its cause. Patients are always advised to take their medications daily to prevent seizures from recurring each day. There are minor side effects with long term intake, esp. on the bone, cognition, blood elements or liver but these can be monitored by the doctor on regular follow-up. Epilepsy should be accurately diagnosed so that an effective treatment can be given. Diagnosis is by a good clinical evaluation from a doctor who is familiar with the disease. In addition, other tests like an EEG (electroencephalogram, recording of brain waves) may be requested to confirm and classify the epilepsy; as well as a CT Scan or MRI of the brain, to find out what is causing it. Once epilepsy is diagnosed, it is important to begin treatment as soon as possible. Research suggests that medication and other treatments may be less successful in treating epilepsy when delayed and when seizures and their consequences have become established. Doctors who treat epilepsy come from many different fields of medicine. They include neurologists, pediatricians, pediatric neurologists, internists, and family physicians, as well as neurosurgeons and doctors called epileptologists who specialize in treating epilepsy. People who need specialized or intensive care for epilepsy may be treated at large Epilepsy centers (at St Luke’s Medical Center, Makati Medical Center, Philippine General Hospital, Medical City, Philippine Children’s Medical Center) and neurology clinics at hospitals or by neurologists in private practice. An EEG costs from between 800- 2500 pesos; while an CT scan costs 5,000- 6,000 pesos; an MRI 7,000 – 12,000 pesos. Medications and other treatments help manage seizures. More than 12 different antiepileptic drugs are now on the market in the Philippines, all with different benefits and side effects. The choice of which drug to prescribe, and at what dosage, depends on many different factors, including the type of seizures a person has, the person’s lifestyle and age, how frequently the seizures occur, and, for a woman, the likelihood that she will become pregnant. People with epilepsy should follow their doctor’s advice and share any concerns they may have regarding their medication. For most people with epilepsy, seizures can be controlled with just one drug at the right dose. Using too many drugs in combination can worsen or aggravate side effects such as fatigue and decreased appetite, so doctors usually prescribe monotherapy, or the use of just one drug, whenever possible. Combinations of drugs are sometimes prescribed if monotherapy fails to effectively control a patient’s seizures. Patients have to take medications 1-3x/day, everyday, for several years and other cases, for their lifetime. Most side effects of antiepileptic drugs are relatively minor, such as fatigue, dizziness, or weight gain. However, severe and life-threatening side effects such as allergic reactions can occur. Epilepsy medication also may predispose people to developing depression or psychoses. People with epilepsy should consult a doctor immediately if they develop any kind of rash while on medication, or if they find themselves depressed or otherwise unable to think in a rational manner. If seizures are controlled within 2-5 years of medications, medications are eventually tapered and discontinued upon the advise of the doctor. Some 20-30% of patients continue to have seizures that impact their daily lives in spite of medications.